Oh, he’s a pain in the arse, isn’t he? So, I’m currently wearing two bits of Barroth armour (head and belt) and the rest is Jaggi. I’m using upgraded Ludroth Pair (dual swords) and doing a fair bit of damage, but that thunder attack keeps wreaking bloody havoc on me. The good news is that a full set of Barroth armour will give me a nice thunder resist bonus. On top of that, some nice ThunderRes decorations will boost it a little more. The trouble is, the three parts of Barroth armour that I’m missing all need Fertile Mud and that just seems to be refusing to drop for me. I think I’m going to take the approach of trying captures, as it seems to drop more frequently in capture rewards than it does just by whacking the mud off him and collecting the sparklies. Sigh. In addition, Earthbound was (finally) released on the VC. It’s really lovely – some great game mechanics and genuinely funny dialogue. Round up round up round up! Closing in on 60 hours played now. SIXTY. Between this and Animal Crossing, I’m really not going to finish off many other games this year. I seem to find myself playing mainly online these days. 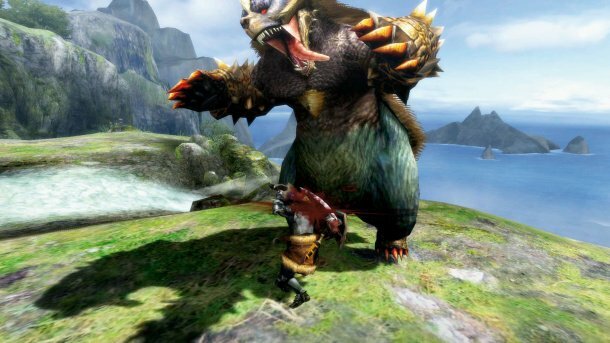 Hunting a monster in a team, regardless of which monster, who the team is, or even what rank everyone is, is always fun. Entering a room and everyone remarking on your rank and then offering to help you rank up is fantastic. I’m HR3 at the moment (but almost HR4), so although it’s still VERY early days, I’ve already been able to help some others reach HR3. 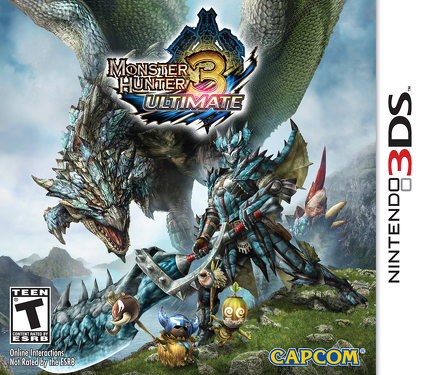 Offline, I’ve reached 5* and just have to capture a Lagiacrus to progress. Well, I say “just” – I find caps pretty difficult. I’ve also completed my Rathalos armour, which has now replaced my Jaggi armour as my default choice. It’s not much better in terms of defence, but I haven’t pimped it out with Armour Spheres to the level I had with the Jaggi stuff, so I can improve it further. Meanwhile, AC has clocked up 90 hours play. Erk. Sold my turnips for a 100% profit, only to find I could have got 500% the next day. That’s the way it is. Still – at least I made a stack load of bells. Made a load more selling perfect pears “abroad”. 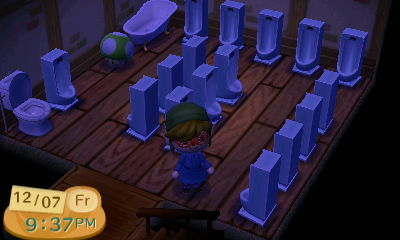 In development news, I’ve built a street clock, a yellow bench, and a fountain, and filled my basement with urinals. This was one of the free games I obtained from the “So Many Games” promotion. It wasn’t one I especially wanted, but it was either this or Pokemon Mystery Dungeon so I tossed a coin. I have never been a fan of the series – I hated the SNES and Game Boy Donkey Kong Country/Land titles, and Donkey Kong 64 almost drove me away from gaming completely, but so far – only half way through the second level – I’ve been pleasantly surprised. I’m actually rather enjoying it, despite it being pretty difficult already. Once Kirby was completed, I returned to this. I’ve now reached Chocolate Island, so I know there’s not that much game left between me and Bowser now!